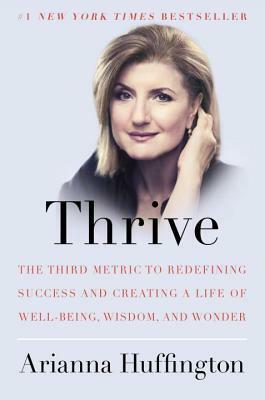 Let me preface this by saying I am a huge admirer of Arianna Huffington. She is a fantastic career woman to look up to—she is successful, put together, and has her stuff together. I also love the Huffington Post. Win-win! So I chose this book to review. I’ve had Thrive for several months now. I’ve picked it up, read a few pages, and set it back down. Rinse and repeat. But I haven’t been able to sit down and really read it. Why? It simply didn’t click with me. There wasn’t any profound advice that I’d never read before—if anything, it read like an inspirational board on Pinterest. I agree with many of her points (after I ended up flipping through and reading at random). After all, is there a universal definition of success? I don’t think so. I think it’s very individualized, despite what society tells us. I think that this book will be great for those in college or just entering the workforce—for me, though, it contained many ideas I’d already read or heard before. Ultimately, it was written well. It was engaging and fun (for the parts that I read). Full disclosure: I received this book from Blogging for Books in exchange for an honest review. I read about 40% of this book and did not finish it.